The Fins of the Helerii are often known as Wagtail. Wagtailfins are distinguished by their black-coloured rays. 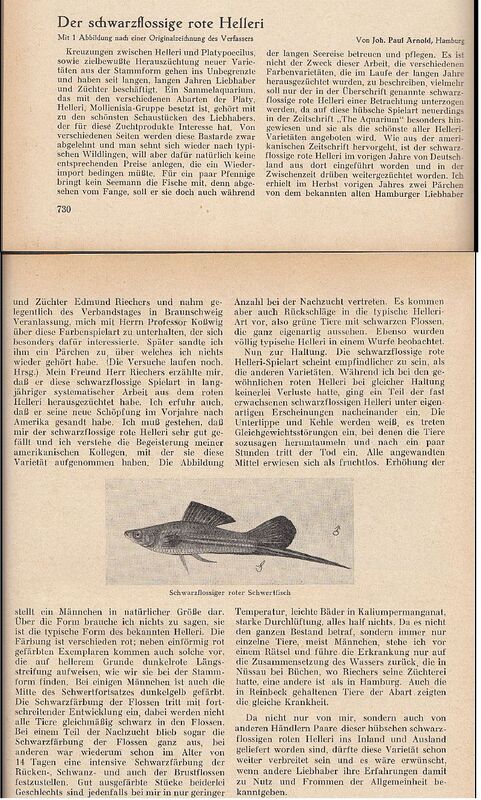 In 1936 the fin's black colouration was published for the first time. There only the membranes between rays where blackcoloured. This phenomena was named "Arnold-factor"
Nowadays in scene swordtails and platies with all-black fins are named Arnoldi-factor. That is not entirely correct, as you can read above. Actually you should call them Wagtails with Arnold-factor. For the last few years I concerned with that kind of fish. Now I own a stock of swordtails with unalloyed Arnoldi-fins. Those fishes are looking remarkable and quite interesting, especially with lyretails as I am breeding them. 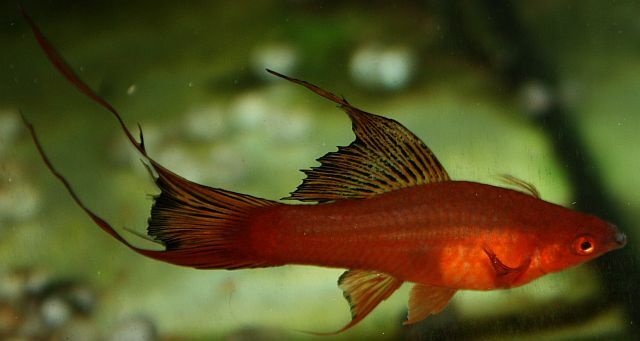 You can already distinguish "unalloyed" Arnoldi-swordtails in the neonatal period by a black colouration at their fin's root, which vanishes as the fish grow. Narutally that is only noticeable if there aren't any further black maculations on the fish. Why do we get to hear and see of those animals, separately showing those characteristics Wagtail and Arnoldi, only recently? As the single factor Arnoldi occured at my plant, it was possible to prove that both factors can be inherited separately. In addition the literature research results also confirmed that our ancestors already knew about that. Due to the lack of fish with "unalloyed" Arnoldi-factor without Wagtail, the knowledge about those had vanished from most breeders' consciousnesses. It appears that the community automatically assumed that Arnoldi and Wagtail are inherited inseparably. Thats also shown by the common standarts which note Wagtail and Arnoldi together. There Hellmut Stallknecht outlines the "oblivion" of the Arnoldi-swordtail nicely. If theres someone interested in the article, I am willing to share it via E-Mail. The appearence of those fish at my plant was hardly surprising. First of all you can say that "unalloyed" Arnoldi-swordtails also occur with other breeders, when they breed swordtails with Arnoldi-factor. At least if there is a breeding partner without black maculation on the fins crossbred in. But to notice the pictured animal, you also have to SEE them. Usually this requires looking closely, as I did. Eversince a friend of mine, who is also a breeder, and I had a heated discussion about this issue, he moans about his selective "Special-Fins' Eye" whenever he rummages pet shops. Thats exactly what happened to me with the "unalloyed" Arnoldi-swordtails in my fish basins. NOW we saw them and now that we saw them, hopefully they won't vanish again in their pure form. Because the effort multiplies if you need to search for them anew.